No, the Atlantic Yards condemnation case was not going to be simple, after all. 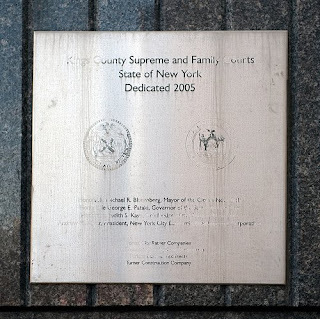 After nearly two hours of oft-contentious oral argument Friday before Kings County Supreme Court Judge Abraham Gerges--argument that, according to counsel for the Empire State Development Corporation (ESDC) went well beyond the proceeding at hand--the judge chose not to rule on the motions and counter-motions filed in the last two days. Gerges's focus is on the narrow law of condemnation, so it would be unusual for him to allow argument on claims that the project has changed so much--and after the chance for public comment on such changes--that the ESDC should issue a new Determination & Findings. So he could simply dismiss the new claims filed by property owners and leaseholders. Or he could ask the ESDC to revise the petition because of technical defects. Or--the longer shot--he could look at the broader claims, or hold this case in abeyance while another court examines those claims. At the least, it's likely that streets planned for closure February 1 will not close, even though developer Forest City Ratner wants Fifth Avenue between Flatbush and Atlantic avenues to close for sewer work needed before arena construction will go forward. In fact, an FCR executive has said that the street should be closed even if the case was delayed. That seems to be on hold. "We will not even ask that [streets] be closed until after vesting [of title]," ESDC attorney Charles Webb told the judge. I sent a query to the ESDC for further confirmation regarding the street closing plan, but didn't get an answer Friday afternoon. The ESDC did say that its real estate consultant, the Cornerstone Group, "continues to meet & work with footprint occupants" as a prelude to relocation. The case drew more than 100 spectators and had to be moved to a larger courtroom. Among those present were executives from Forest City Ratner (headquartered just a few blocks away) and ESDC, and City Council Member Letitia James, the project's leading political opponent. No other elected officials were there. Filling the room were numerous project supporters and opponents, wearing, variously, buttons saying "Jobs Housing Hoops" and "Develop Don't Destroy Brooklyn." Among the supporters were members of construction unions and the Community Benefits Agreement signatory Brooklyn United for Innovative Local Development (BUILD), which had a sign-in for its members. Gerges was not unskeptical about the claims raised by attorney Matthew Brinckerhoff, representing several footprint property owners and a leaseholder, who argued that changes in the project after the ESDC's 2006 approval of the eminent domain Determination & Findings (D&F) were so significant that a new D&F was required. Weren't such issues supposed to be dealt with in other cases, the judge asked. Brinckerhoff pointed out that other courts considering AY-related cases had relied solely on the record as of December 2006. "The fact that they changed the project so much has to be considered by someone," he said. Brinckerhoff suggested, by way of example, a situation in which a D&F had been approved but there was absolutely no financing for a project. In such a case, despite the D&F, he said, a condemnation court would not have transferred title. He said: "The question is: where on the continuum from nothing changing to everything changing do we get heard?" As noted below, Webb relied on a case known as Leichter, which he suggested disposed of all of Brinckerhoff's claims. However, as the excerpt at bottom shows, it could point both ways. Below is a post-argument interview with Brinckerhoff; here's a link to a summary. 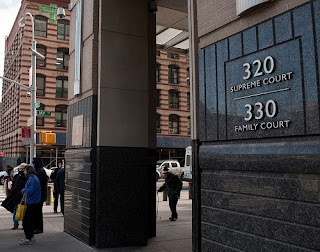 In these cases, Brinckerhoff represents condo resident Daniel Goldstein, commercial property owners Henry Weinstein (via two separate entities) and Peter Williams, and Freddy's Bar & Backroom. In the new case but not the condemnation case, he also represents a homeowner facing condemnation in the second round of takings. In neither case does he represent residential renters, because their rights are "subservient" to owners. Not all of those facing condemnation were there to oppose the petition; some others were there to negotiate the process of compensation. 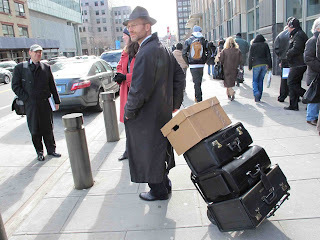 The case was scheduled to be heard at 9:30 am, or so we thought, and those of us who arrived at the courthouse at 9:25 am took more than 20 minutes to get through security. With the security line snaking back around I several times crossed pass with ESDC attorneys and was within a few feet of the Forest City Ratner cluster of Maryanne Gilmartin, Jane Marshall, and David Berliner. In Gerges' courtroom, there was a bit of anticlimax. He decided to hear some shorter, more routine condemnation cases first, telling the crowd, "I know there's a lot of people here on Atlantic Terminal"--a rather inexact description of the case. He moved the case from a 17th floor courtroom to a larger courtroom on the second floor, a transition that took no short while. Webb, a ruddy, white-haired man, began by reading, fairly methodically, the boilerplate description of the required procedures for eminent domain, among them the description of the project and a public hearing. He noted that challenges to eminent domain in both federal and state court had been dismissed. At his direction, an associate unveiled two large maps of the footprint, showing first the lots at stake and then those lots occupied by businesses or residents--a much smaller number. Of 58 total lots sought for the first stage of condemnation, only 12 are owned by private entities, he said. "We're asking for title today, not vacant possession," he said, a reference to a situation that would obtain, at best, 90 days later. He mentioned that the ESDC had received two answers to its petition to condemn, a brief one sent by the law firm Goldstein, Goldstein & Rikon, which specializes in condemnation. It did not oppose the condemnation but asked for three years to resolve valuation claims. Webb said ESDC opposed that, given the need to pay a 9% increase in its condemnation award (funded by the developer) each year. "We are requesting 120 days," Webb said. "After five years of knowing this is going to take place, they certainly should know they have a claim." "The second answer"--that filed by Brinckerhoff--"raises a whole host of issues, nearly all of which are not properly raised in an Article 4 proceeding," Webb declared. Gerges asked if there were any issues in the filing not raised in the Court of Appeals decision on eminent domain for Atlantic Yards. Brinckerhoff, from his seat, nodded. Webb mentioned a few elements dismissively, and charged that Brinckerhoff's clients "needlessly complicate this matter... Their whole point is to cause delay from Day 1." He then aimed to trace for Gerges the litigation in the case, to "demonstrate their strategy to abuse the judicial system by bringing lawsuit after lawsuit." He ran through a series of cases, some of which had not been filed by Brinckerhoff's clients nor organized and funded, as this case is, by Develop Don't Destroy Brooklyn. Webb asserted that the 2009 Modified General Project Plan (MGPP) did not change the boundaries or the public purpose of the project; "the principal difference is the phasing of the property acquisition." Rather than have the entire project site be acquired in one condemnation, there would be two or more phases--thus saving Forest City Ratner tens of millions of dollars. On January 19, the last day possible in the four-month window to challenge the MGPP, six condemnees filed an Article 78 petition (below) in state Supreme Court alleging that the MGPP should have contained new findings of public benefits. "We haven't been served [the petition]," he said, decrying "last minute tactics." Webb, maintaining a general air of indignation, responded to several of the affirmative defenses raised by Brinckerhoff. No, he said, a complete copy of the petition need not be served on each respondent; the map need only concern the specific property at hand. "That's the first and presumably best foot forward defense," he said dismissively. As for the claim that the condemnation petition was filed too late, more than three years after the D&F, he noted that the clock can be stopped while challenges to eminent domain are considered in court. What about the respondents' claim that the petition does not set forth "the public use, benefit or purpose for which the property is required"? Webb said that the fourth and fifth paragraphs of the petition did exactly that, stating that the project "involves the renewal and redevelopment of a blighted area in the Atlantic Terminal section of Brooklyn through the clearance, replanning and reconstruction of the area and the construction thereon of a major mixed-use development." The project, pursuant to the MGPP, calls for a new arena, 16 towers, and a reconfigured rail yard. And that project, he said, is "absolutely a public use," confirmed by court decisions. The respondents argued that the D&F fails "because the public use, benefit or purpose therein has changed materially" from that described in December 2006. Webb said no, that the "public use, benefit, or purpose has remained the same." Brinckerhoff began taking vigorous notes. Webb dismissed as an oversight the charge that the petition did not contain a list of the initial properties sought for condemnation. As for the seeming contradiction between two parts of the petition, which state variously that respondents have 90 or 120 days to file a claim for damages, Webb called it an "inadvertent error," charging that "they're really grasping at straws." The respondents argued that if property is condemned in stages, it must be proposed as a staged acquisition at the public hearing stage. Webb said a public hearing was not required, pointing to a 1989 Appellate Division case regarding the Times Square redevelopment known as Leichter v. New York State Urban Development Corporation. "Perhaps they overlooked it," he said, handing a copy to Brinckerhoff. "That decision directly addressed changes in a project from one stage." There would be more discussion and disagreement later about Leichter. The respondents argue that condemnation, according to the 2009 MGPP, should not occur until there are guarantees that Forest City Ratner would promptly build the arena, but the bond document states that an additional $324.8 million is required to complete the arena, with no assurances that it would arrive. Webb said the issue was irrelevant to the eminent domain proceeding. "And that is the end of their affirmative defenses," Webb said. As for the counterclaims raised, "they're totally inappropriate," he said. "However, we have, in an exercise of caution, prepared a reply." He did not, in oral argument, detail the reply to charges, for example, that the primary public benefit in the D&F was the elimination of blight, which likely would persist due to no development over most of the railyard. Our holding is further supported by a consideration of the practicalities surrounding a project of this scale. As appellants point out in their brief, during the time that this project has been delayed due, in no small part, to attendant litigation, "the real estate market in Midtown Manhattan dramatically changed." In addition, several developers withdrew from the project for financial and other reasons. It is clear to this court that if respondent is required to start the hearing process anew, conditions will very likely have changed again by the time the amended plan emerges from the approval process with the attendant legal challenges, thereby extending the review procedure ad infinitum. The hearing requirements set forth in the Eminent Domain Procedure Law and the Urban Development Corporation Act are designed to solicit community involvement in the planning process, not to serve as a vehicle by which public development can be effectively foreclosed. 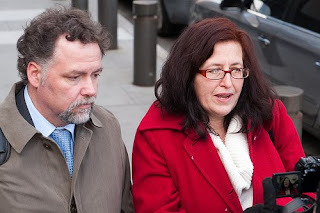 Webb closed by asking the court to approve the condemnation order. "I take real umbrage at that," Brinckerhoff said, saying "this is about people's properties, homes, and businesses." As for the issues being inappropriately raised, Brinckerhoff said they all arose since the D&F and that the ESDC, endorsed by courts, has repeatedly said that claims were limited to the record from 2006. "If we can't raise it here, we can raise it nowhere," he said. "Did the Court of Appeals find there was a public purpose?" asked Gerges. "They didn't make any finding," Brinckerhoff replied, noting that the court, like others, deferred to the "self-serving record" complied by the ESDC. "Almost everything in the finding has changed. We have to be able to raise this somewhere." "The accusations that we are somehow gaming the system are really incredible," declared Brinckerhoff, noting that details about the timing and scope of the project were revealed only in September--after the MGPP was approved--and in master closing documents this week. "We were told in 2006 that it would take ten years," he added, but now it could take 25 years, thus vitiating blight removal as the primary public purpose. "The developer has carte blanche to ultimately not build a unit of affordable housing," he said in a stretch; there is an option, renewable for eight years, to not build affordable housing in Phase 1, thus potentially extending the process to 18 years, but it sure looks like at least one building would be built, thanks to an unusual combination of subsidies. He said the project, approved at 7.9 million square feet, could be only about 4 million square feet--actually, the project could be less than 4.5 million square feet, plus an arena that would be 675,000 square feet, still significantly less than the project as approved. On firmer ground, he said that the findings of economic benefit were no longer valid, because of increased public subsidies--and, I'd add, the extreme unlikelihood that the announced office tower would be built in a timely manner. "All of these issues are new issues," he said insistently. He addressed Webb's recital of the official public purpose. "It doesn't mention jobs. It doesn't mention blight," he said. Given the likelihood of extended interim surface parking, he asked, "Is that remediating blight or creating blight?" While Webb said that Forest City Ratner has bought most of the property it needs, Brinckerhoff noted that his adversary failed to point out that the developer did so thanks to $131 million in city subsidies. He suggested that, "at barest minimum," Gerges should grant a stay until the Court of Appeals rules on a motion for reargument in the eminent domain case, a ruling that wouldn't come until at least February 9. Gerges asked if they'd asked the Court of Appeals for a stay. Brinckerhoff said no, because he'd anticipated the decision would have been issued already. He offered a caution about a potential messy scenario in which title is transferred, then required to be transferred back if the Court of Appeals or Justice Marcy Friedman rule against the ESDC. Brinckerhoff moved on to his analogy regarding the court's presumed unwillingness to transfer title if no financing were available. "What has happened is the fundamental equivalent of the project being abandoned," he said. Gerges pointed out that courts are supposed to defer to legislative agencies. "There are limits to that deference," Brinckerhoff said, pointing to the unelected three ESDC board members who approved the plan, based on blight findings--including sidewalk cracks and underutilization--made by environmental consultant AKRF, which was slammed in the Columbia case. "The reason we have courts is so they can rein in agencies when they go too far," he said. "The only thing we know we're getting is an arena," he said, failing to acknowledge the one promised housing tower. "And we know the arena is not a benefit to the public," he continued, pointing to New York City Independent Budget Office cost-benefit analysis that it would be a net loss to the city--a study to which the ESDC responded by pointing to its less rigorous benefit analysis, based significantly on taxes from that phantom office tower. "We are entitled to raise these issues," Brinckerhoff said. "No court should stick its head in the sand. We'll go [to court] where we're told to go." The energy in the courtroom calmed a bit as attorney Joshua Rikon explained why his clients needed three years to establish valuation, a timetable parallel to that in the Court of Claims. There are a limited number of experts who can assess the valuation of trade fixtures, he said. "One of my clients is under duress, because of complex financing terms and the tenant is no longer paying rent," Rikon said, referring to the owner of the building housing the privately-run Pacific Dean homeless shelter, now vacated. Webb said that, once a vesting order is issued, advance payment--potentially a good portion of the final value--could be made within 30 days. Gerges pointed out that, to save on the costs of interest, it's wise for the government to get that advance payment out as quickly as possible. Attorney Bruce Lederman, who represents the operator of the homeless shelter, said all families had been relocated. He asked for a year from vesting to file a fixture claim. Rikon said that the planned closing of streets would impede one client, Pack It Away Storage. "We ask that streets remain open," he said. Webb said that the request for closure would not be made until after vesting. Pack It Away occupies a piece of the otherwise demolished Ward Bakery building; the September 2007 photo shows both the still-extant business and the now-demolished building. Webb, somewhat exasperated, said that "I'm responding against my better judgment" to issues raised in Brinckerhoff's motion. The 2009 MGPP and 2006 MGPP are "virtually identical," he said, including the same 17 buidlings, the same uses, the same eight acres of open space, the same subway entrance--not quite, given that a temporary canopy might last ten years--and a new Long Island Rail Road yard (which would not be the same size, actually). "The principle change is that the project [site] will be acquired in phases," he said. He returned to the Leichter case, suggesting that the changes there were much more dramatic--not merely the sequential rather than simultaneous acquisition but also the expansion of use for a site originally designated as a wholesale facility mart to encompass a commercial office tower. He offered evidence to back up his contention of project opponents' strategy of delay, in both cases reading passages from news articles that relied on paraphrasing. Daniel Goldstein, a leader and spokesman of Develop Don’t Destroy, said he did not believe Forest City would meet the deadline, not with his group’s appeal of the eminent domain decision and intention to file more lawsuits to delay the project until its death. “We will oppose [that proceeding] because the pieces aren’t in place,” said DDDB Legal Director Candace Carponter. This will lead to perhaps more litigation and cause Ratner further delays. There will also need to be a determination made by the court as to what “just compensation” is and how much the residents who are being displaced will be paid for their land and buildings." Webb told Gerges that the closing of Fifth Avenue was needed for ongoing sewer work. And, in the kind of straining that he attributed to his adversary, he offered a not-so-convincing factoid. "I attended every public hearing," he said, indicating that "seventy-five percent of the people [there] were looking for jobs and wanted the project to proceed.... This record should be closed." Gerges demurred, noting that, despite the years of litigation on the project, it was new before this court, including the most recent motions. He promised to proceed expeditiously. Appellants' position is based on a selective reading of the Eminent Domain Procedure Law. They argue that the law "contemplates that a Project will not be altered significantly once the condemning authority's determination and findings are published." They cite the provisions of EDPL 205 for the proposition that "after hearing and publication, the condemning authority shall have the right to make amendments or alterations in its proposed public project only in the event that further study of field conditions [warrants]' [emphasis supplied]." They conclude, "Unless the proposed amendment accommodates such field conditions', the amendment requires further review under the EDPL." The provision of EDPL 205 which petitioners fail to cite is the sentence which states, "Such amendments or alterations shall not require further public hearings nor invalidate any acquisition for the proposed public project." It is clear, therefore, that this section governs only those amendments in the plan which may be instituted without further hearings. It does not govern the situation, in issue upon this appeal, where a plan is modified and a public hearing is held concerning the modification. But the issues raised by Brinckerhoff--the potential for a significantly smaller and delayed project--did not surface until after the project was approved and were not in the 2009 MGPP. The potential for a delayed buildout was in a Technical Memorandum issued by the ESDC, but the penalties and incentives did not surface until after the master closing, in documents made public this week. I'm sorry that I'm a bit slow, but what does all of this mean? Did the judge adjorn the proceedings until he reviews the petitions? What happens next and when? Exactly. No vesting of title today. If he rules in favor of the state, then title will vest. That could happen in a week or two. Alternatively, he could rule on technical grounds and ask that the ESDC submit a revised petition. That could delay things somewhat but not necessarily affect the substance of the case. The unresolved question is whether he will address the broader issues raised. I will write about this in my longer report, probably tomorrow a.m. In other words, the law allows the passing of title only when it's the same project as approved. The legal defenses asserted by DDDB go to the heart of the explicit conditions set out in the law. ESDC cannot meet these explicit legal requirements, because the project has changed. You said: "A public hearing was in fact held concerning the modifications in the 2009 MGPP." This statement is not correct. ESDC did not treat the 2009 hearing as an EDPL hearing, subject to appeal under EDPL Article 2. Thus, it was not a meaningful hearing subject to judicial review, which is the main point of DDDB's correct argument. Said otherwise, a public gripe session is legally insufficient if it goes nowhere. And shame on Charlie Webb for accusing DDDB of "abusing the legal system". A politically-connected attorney who represent a corrupt and lawless state agency that abandons its duty to all citizens, so that a rapacious amoral developer with political clout and flush with public money can destroy a neighborhood, should save his slanderous remarks for private moments with Bruce or Brett or Mike or Marty, and their unsavory ilk, who care not a wit for the needs of ordinary New Yorkers. We do not need Webb's empty homilies, but we do need an independent judiciary, a watchful legislature, a competent governor, and an honest mayor -- none of which we now have. Note that the case is not brought by DDDB, though it is organized and funded by the group.